Recently I attended a security related vendor lab training session and to be surprise I got a nasty present from the network when I am connected. There was a virus running loose in the classeroom and it has attempted (actually managed) to write itself to whichever share it can find. Not bad at all. I got tons of the same file in different folders and name all 81,920 bytes. 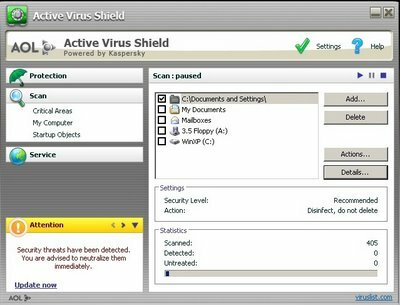 OK, lets not worry what virus this is because my AOL (actually its Kaspersky) Antivirus has found it and killed it on the spot. It was fortunately I was armed even though this was my crappy P3 1.0Ghz office notebook. Imagine what if I wasn't.